Who doesn’t love rainbows? 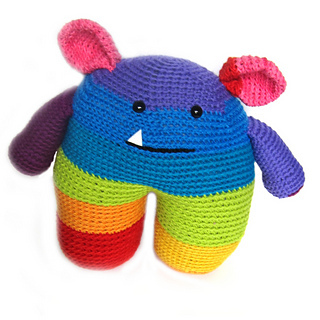 And seriously… who can resist that tooth? 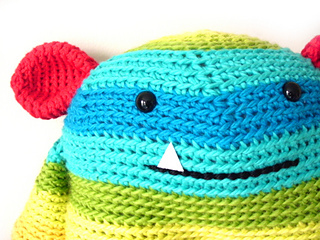 You can also use a variegated yarn… and he’ll look totally adorable without you needing to change colors! 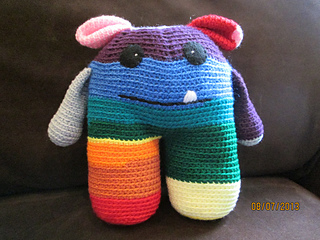 Roy measures 11” tall when completed with worsted weight yarn, but can be made bigger or smaller by using thicker or thinner yarn! 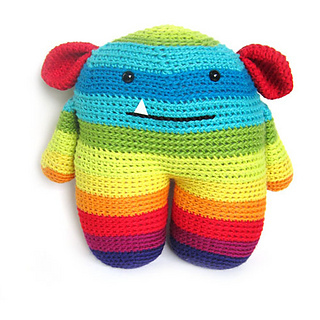 This cutie is an intermediate-level pattern that requires basic crochet skills. This pattern is a pdf that contains progress photos of all the important steps, so you won’t get lost! 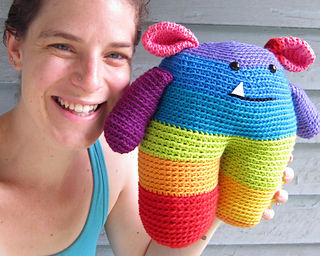 This pattern includes instructions for making a ‘random monster’ (2nd photo) and a ‘matching stripes monster’ (1st photo). 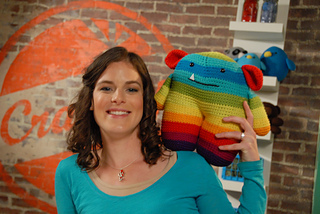 The exact color change counts (for the matching stripes monster) depends on the number of colors you are using!